This is a blues rock album from Bob Dylan, played straight and without frills by a tight as a gnat's chuff band and by a Dylan sounding lively and committed. It was, apparently, recorded very quickly, but therein lies its appeal. It sounds almost "live" and is all the better for it. Dylan collaborated on the songwriting with The Grateful Dead's Robert Hunter, with whom he had written a couple of good songs on 1988's "Down In The Groove". "Beyond Here Lies Nothing" is a harmonica, bass, guitar and rums-driven industrial chugging blues with some great instrumental breaks and Dylan's croaky old voice strangely powerful and charismatic. Dylan's pre-occupation with "Americana" music from the pre-rock'n'roll days (something begun strongly in "Time Out Of Mind and "Love And Theft") is exemplified in the slow, folky, croony ballad "Life Is Hard". "My Wife's Home Town" is a very stark, bluesy number in the style of which continued on the next album, "Tempest". "Hell's my Wife's home town..." sings a cynical, world-weary Dylan over a classic four-note blues riff. "If You Ever Go To Houston" is another one sung over a repeated riff, this time played on an accordion (or something similar). This is an album very much rooted in the past, in both musical and lyrical history, speaking of an almost mythical American past, a seemingly forever stuck in the 1950s sort of groove. "Forgetful Heart" starts with lots of hissy, crackling noise in the background, as if it were an old blues record. 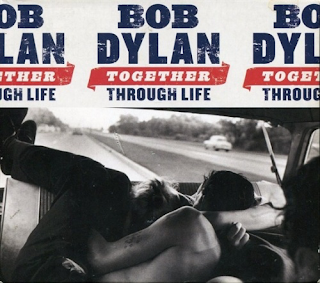 Dylan's ageing but strangely comforting voice suits the slow grinding melody down to the ground. There is some great scratchy guitar on here. "Jolene" is not the Dolly Parton number, but another copper-bottomed blues with some seriously top notch guitar riffery. This album cooks, big time. "This Dream Of You" has Dylan going all Tex-Mex, complete with accordion and yearning lovelorn Latin vocal. It is a quite endearing, most enjoyable song. A lot of people didn't seem to like this album, as they didn't like "Tempest" either. They don't seem to like an old man continuing his career singing bluesy songs based in style on a time long gone by, yet they also seem to want him to come out with stuff that matched his material from forty-five years previous to the recording of this album. Not going to happen. A blues like "Shake Shake Mama" would have been perfectly acceptable on "Blonde On Blonde", given the "wild mercury" treatment, so why not accept it here, with its down 'n' dirty guitar sound and gruff vocal. None of these artists can re-create their genius from their twenties - not Dylan, Springsteen, Morrison, Costello, The Stones, McCartney, Elton John, Paul Simon - any of them. It does not mean what they do in later years is not worthy of attention, in my opinion. I really like this album. "I Feel A Change Comin' On" again has some essential accordion, some searing guitar and yet another wise-sounding Dylan vocal about "reading James Joyce...". He was always good for a literary name-drop, like Van Morrison. "It's All Good" sings a wry Dylan above another classic, often used blues riff on the energetic, shuffling closer. It has all been good, Bob. All of it.